The rise of the University of Oregon football program began back in 1994 on a glorious autumn afternoon at Autzen Stadium in Eugene, Oregon. As the 4th quarter ticked away, the Huskies at the Oregon 8 yard line, and the Ducks desperately clinging to a 24 – 20 lead over the #9 Washington Huskies, the most famous play in Duck football history would unfold. The Ducks had won only three games against the Huskies in 20 seasons. As the Huskies prepared to apply another heartbreaking defeat to the lowly Ducks it happened… “The Pick“, as it is referred to amongst Duck fans. With just over a minute remaining in the game and the Huskies poised to take the lead, Washington quarterback Damon Huard threw an interception that Kenny Wheaton returned for a 97-yard touchdown, sealing the win for the Ducks and propelling the University of Oregon to the Rose Bowl. Shortly after the 1994 season, Nike founder Phil Knight began contributing millions of dollars to upgrade the University of Oregon athletic facilities which are now second to none. Over the past 15 years, the University of Oregon has expanded Autzen Stadium, added a new baseball stadium, PK Park for which Portland Bolt supplied anchor bolts, and most recently replaced aging MacArthur Court with the Mathew Knight Basketball Arena. 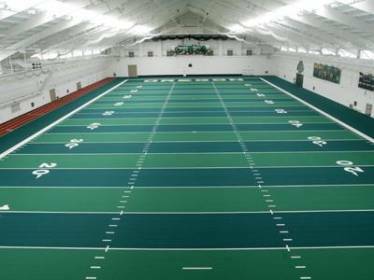 One of the initial facilities upgrade projects began in March of 1997 when the University of Oregon broke ground on a state of the art indoor football practice facility known as the Moshofsky Center. Portland Bolt manufactured 520 high strength anchor bolts measuring 2″ in diameter and 51″ in length. These anchor bolts support the massive structural steel frame of this multipurpose facility.